Every fifty years Deepgate’s scarred angel, Carnival, returns to murder another descendant. 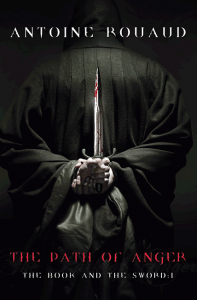 Now, five hundred years after the first victim’s death, Sal Greene is facing his own doom. His time has almost run out. In a desperate attempt to break the chain of violence and save his family, he summons a demon to the chained city: a warrior he hopes is powerful enough to stand against the angel. Yet the creature which arrives in Deepgate is not quite the legendary mercenary Sal Greene was expecting. [Lye Street] …also has some strikingly beautiful moments, in that harsh, dark way some of us love so well. 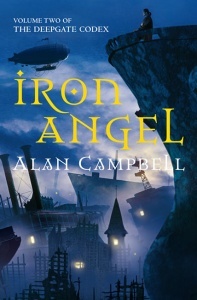 The journey of the angel Carnival is most compelling, as she simultaneously follows and flees messages seemingly addressed to her, scrawled across the walls and tunnels and towers of the dangling city. Neatly juxtaposed are Sal Greene’s sojourns through demonic realms as he struggles to save his family from Carnival’s murderous intent. This is a world where good and evil are not absolutes, where it is as easy to sympathize and root for an unearthly murderer as it is for her future victim. Campbell meshes pity with terror against the bleak phantasmagoric backdrop of a city suspended from chains, swinging dismally over a yawning abyss. 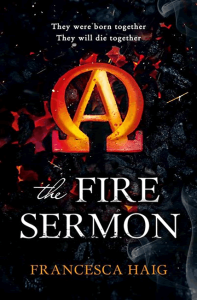 In a civilization literally built upon nothing, dark magic and vengeance are the rule of the day, and Campbell will quickly have readers under his creepy and sometimes heartbreaking spell. Subterranean Press is widely considered one of the finest publishers of special edition books for collectors. 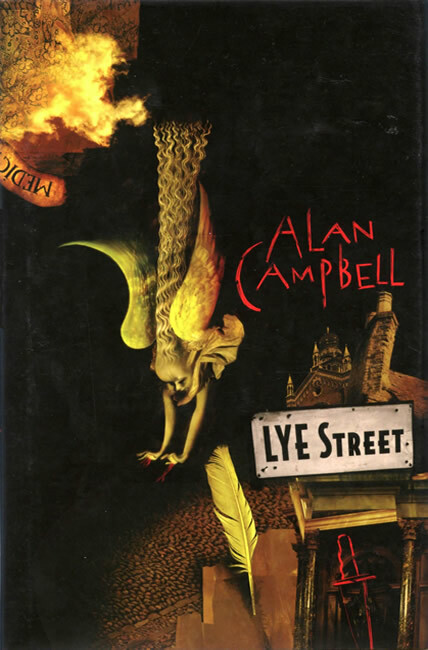 In 2008, they published Alan Campbell’s 26,000-word novella, Lye Street. 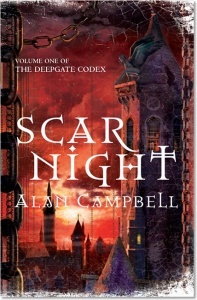 This is a prequel to the first volume of the Deepgate Codex and it ends where Scar Night begins. This book is one of a limited edition of 2,000 signed, fully cloth bound, unnumbered copies. Its interior illustrations are by Hugo Award-winning artist Bob Eggleton. 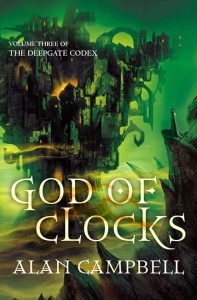 The jacket illustration is by World Fantasy Award-winning artist Dave McKean. Subterranean also produced a lettered edition of 26 leather-bound copies with a custom tray case. Both of these special editions are now scarce and difficult to come by. Gold coloured, fully cloth bound cover with metallic red text / motif on spine, red decorative head and tail bands, and pale cream endpapers. To make the book more robust and easier to open, the pages are section bound using a premium cream paper. Yes – on an illustrated, textured white signature page that’s tipped-in to the first section of the text block (before the half title page).